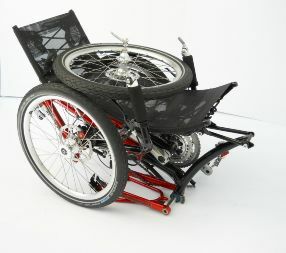 We are developers who saw the need for convenient, fast folding, compact folding trikes. That led us to imagine the revolutionary folding mechanisms and architecture in our trikes. It has since taken thousands of hours of innovation, development and thousands of miles of proving to achieve designs that are robust, reliable, super-compact, convenient and inherently safe – all joints close under rider weight and pedal force. 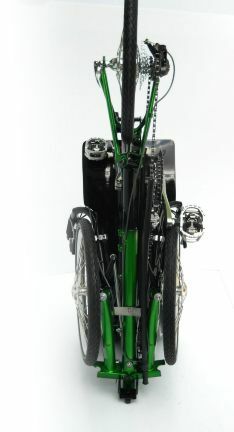 We have lately been refining our designs to make them commercial-ready and the current trikes are the result. We want to get trikes based on our mechanisms to market as soon as possible. 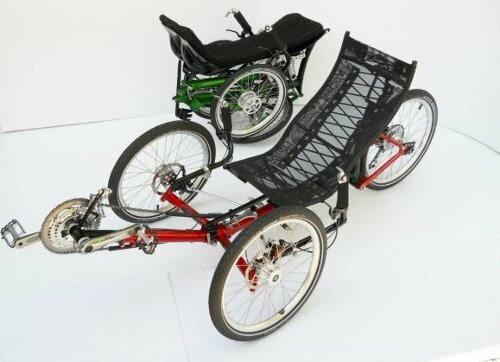 We are open to teaming up with a company who can combine our trike folding technology know-how with their existing ideas and experience to get trikes to market within a reasonable timeframe. – who think they could use our patent pending folding technology. – who are interested in entering into some sort of business arrangement, possibly including exclusive licence. We are an Australian-American design team working currently in Australia but with ties in both countries. *Several unique folding mechanisms, patent pending. *Compact hinges allow sleek performance geometry, low CofG, efficient chain line & single pulley drive. *A mutually reinforcing compound hinge folds the cross-members, boom and also locks the seat. Mutual hinge reinforcement maximises strength, minimises size and weight. *Rider weight and pedalling force naturally close all hinges for added security. *Folded sizes achieved using standard cranks, pedals, gears etc. *Modular frame can allow alternative forms for different uses. *The folding geometry produces neat folded forms very suitable for suitcase or duffle bag. *Compact size and shape can allow cheap air travel. 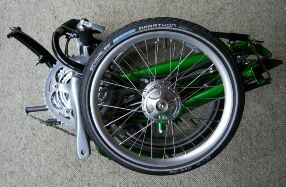 *Staged folding allows folding the trike only as much as you need to, and usually the first fold is enough. Our standard suitcase folders use super-strong 349 (16in) wheels so prominent in the Australian Pedal Prix trike racing scene. 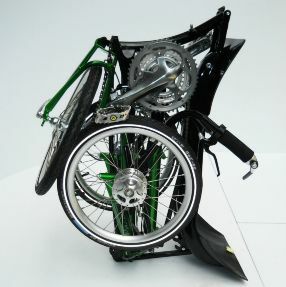 Staged folding allows folding the trike only as much as you need, and usually the first fold is enough. No tools are needed, and the seat always stays attached. Just one Q/R and a naturally located safety catch folds seat, front wheels, boom. 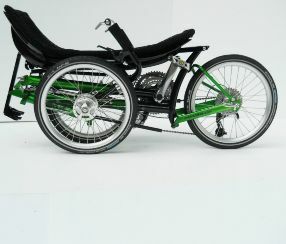 Catches hold the trike in a neat one-piece package when folded. Additionally folds the rear wheel with a thumb activated seatstay catch. Firstly, sorry, our trikes are not on sale yet. We will publicise when they are. We would like to get them on the market as soon as possible. With all the processes and lead times required that will realistically be in the latter half of 2012 at the earliest. Our specific model specs and then pricing can only be determined as we go through the detail of that process. We do expect our single stage folders to sell for just a modest amount more than an equivalent trike of equivalent component level that doesn’t have our folding capability. The suitcase capable models will require lighter components to keep within airline weight limit, so will need to reflect that cost. We think these costs will be good value for the unrestricted travel opportunities and daily hassle-free convenience the owner will enjoy every time they use their trike. You can provide your input into helping us to decide which model to release first. Is the folding level of a 20in folder with a rigid rear sufficient for you or would you choose a 16in with its smaller folded size and that benefit? Just a “16” or a “20” on the first line is enough. If you have other strong preferences please list each on a separate line like “mesh seat”. If you would like to make a comment/give a reason, please add it to the end of the same line.